First uncovered in November last year, the DNSpionage attacks used compromised sites and crafted malicious documents to infect victims’ computers with DNSpionage—a custom remote administrative tool that uses HTTP and DNS communication to communicate with the attacker-controlled command and control server. According to a new report published by Cisco’s Talos threat research team, the group has adopted some new tactics, techniques and procedures to improve the efficacy of their operations, making their cyber attacks more targeted, organised and sophisticated in nature. 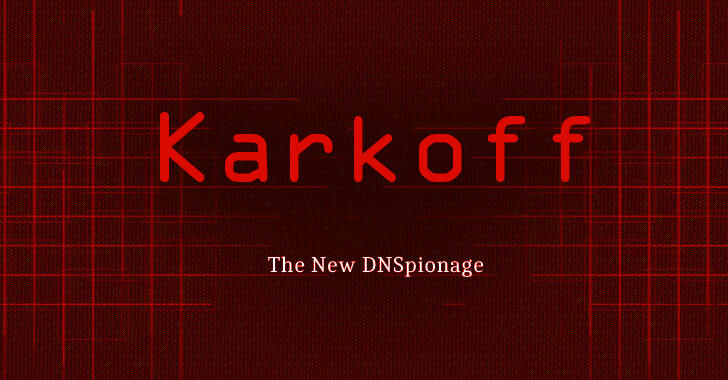 Unlike previous campaigns, attackers have now started performing reconnaissance on its victims before infecting them with a new piece of malware, dubbed Karkoff, allowing them to selectively choose which targets to infect in order to remain undetected. “We identified infrastructure overlaps in the DNSpionage and the Karkoff cases,” the researchers say. During Reconnaissance phase, attackers gather system information related to the workstation environment, operating system, domain, and list of running processes on the victims’ machine. “The malware searches for two specific anti-virus platforms: Avira and Avast. If one of these security products is installed on the system and identified during the reconnaissance phase, a specific flag will be set, and some options from the configuration file will be ignored,” the researchers say. Developed in .NET, Karkoff allows attackers to execute arbitrary code on compromised hosts remotely from their C&C server. Cisco Talos identified Karkoff as undocumented malware earlier this month. What’s interesting is that the Karkoff malware generates a log file on the victims’ systems which contains a list of all commands it has executed with a timestamp. “This log file can be easily used to create a timeline of the command execution which can be extremely useful when responding to this type of threat,” the researchers explain. Like the last DNSpionage campaign, the recently discovered attacks also target the Middle Eastern region, including Lebanon and the United Arab Emirates (UAE). Besides disabling macros and using reliable antivirus software, you should most importantly stay vigilant and keep yourself informed about social engineering techniques in order to reduce the risk of becoming a victim of such attacks. Due to several public reports of DNS hijacking attacks, the U.S. Department of Homeland Security (DHS) earlier this year issued an “emergency directive” to all federal agencies ordering IT staff to audit DNS records for their respective website domains, or other agency-managed domains. Russian hackers have apparently launched cyberattacks against American embassies, although it might not be the kind of campaign you’re expecting. Check Point Research reports that the attackers have attempted to compromise PCs at embassies in countries like Italy, Bermuda and Kenya by tricking officials into loading malware. Most often, they emailed Excel spreadsheets with malicious macros that would hijack a computer using the popular remote access app TeamViewer. The attackers don’t seem to be state-backed, though. They’ve also attacked government officials at “several” revenue authorities, and Check Point noted that there have been similar campaigns that targeted Russian speakers. At least one of the culprits, nicknamed EvaPiks, has been linked to a hacking forum where card theft was a subject of discussion. The intruders may be “financially motivated” based on this evidence, Check Point said. As it is, the group is occasionally sloppy. While it planned the campaign and created false documents specific to each target, some parts of the campaign have left the attacker’s personal info exposed. If this is a state attack, it wasn’t a particularly good one. Not that this is much comfort to victims — they’ve had potentially sensitive data exposed to crooks who intend to abuse it. His attorney Marcia Hofmann did not immediately return a request for comment. Electronic Arts has fixed a vulnerability in its online gaming platform Origin after security researchers found they could trick an unsuspecting gamer into remotely running malicious code on their computer. The bug affected Windows users with the Origin app installed. Tens of millions of gamers use the Origin app to buy, access and download games. To make it easier to access an individual game’s store from the web, the client has its own URL scheme that allows gamers to open the app and load a game from a web page by clicking a link with origin:// in the address. But two security researchers, Daley Bee and Dominik Penner of Underdog Security, found that the app could be tricked into running any app on the victims computer. “An attacker could’ve ran anything they wanted,” Bee told TechCrunch. The researchers gave TechCrunch proof-of-concept code to test the bug for ourselves. The code allowed any app to run at the same level of privileges as the logged-in user. In this case, the researchers popped open the Windows calculator — the go-to app for hackers to show they can run code remotely on an affected computer. But worse, a hacker could send malicious PowerShell commands, an in-built app often used by attackers to download additional malicious components and install ransomware. Bee said a malicious link could be sent as an email or listed on a webpage, but could also triggered if the malicious code was combined with a cross-site scripting exploit that ran automatically in the browser. It was also possible to steal a user’s account access token using a single line of code, allowing a hacker to gain access to a user’s account without needing their password. Origin’s macOS client wasn’t affected by the bug. EA spokesperson John Reseburg confirmed a fix was rolled out Monday. TechCrunch confirmed the code no longer worked following the update.